Ideal for dry to very dry skin with itching. 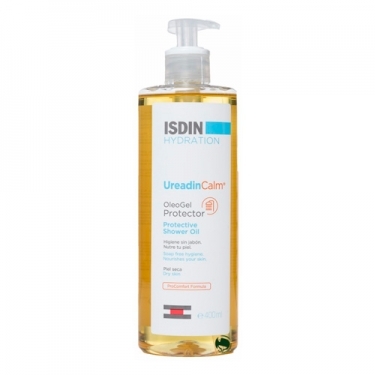 DESCRIPTION: Ureadin Calm Oleo Gel Protector from Isdin is a shower gel, which helps to gently clean, while nourishing and protecting against dry skin. He washes gently and softens. Nourishes to protect against dryness. Relieves itching sensation. Strengthens the skin barrier for a feeling of comfort and softness. Ideal for dry to very dry skin with itching. It is suitable for cleaning and softening very dry and itchy skin. Formulated to relieve itching and moisturize delicately dry skin, this gel oil contains the ProComfort formula with dexpanthenol and omega 3 and 6 essential fatty acids to strengthen the skin barrier and give a feeling of intense comfort to the skin. This product cleans without soap and the natural oils of soybean and rebalance of castor oil and deeply nourish the skin. Formulated without parabens or corticoids. For a relaxing experience, add 5 servings of product to the bath water.